Apple is cracking down hard on companies that have been abusing its Enterprise Certificate program, and Google today joined Facebook in losing access to Apple’s internal app tools, reports The Verge. Google, like Facebook, was using its Enterprise Certificate designed for internal employee apps to distribute an iOS app called “Screenwise Meter” to customers. Screenwise Meter was an app designed to collect information on internet usage, including details on how long a person spends on a site to the apps that are downloaded on a device. Apple does not allow data collecting apps like Screenwise Meter on the App Store, so Google asked customers to download it using an Enterprise Certificate. 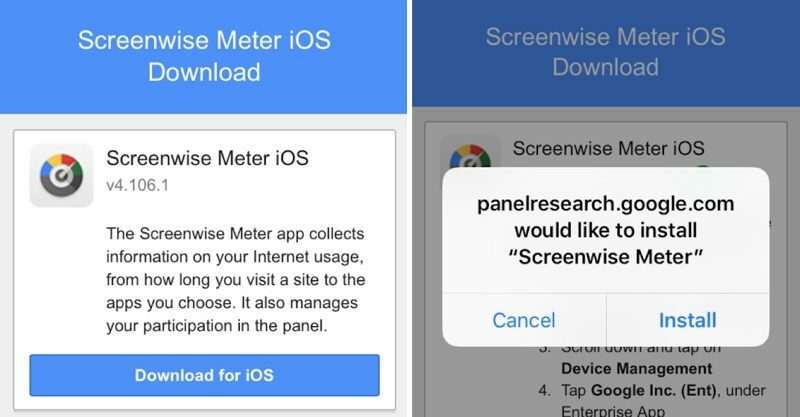 By having customers install Screenwise Meter this way, Google was able to bypass Apple’s App Store rules. Google was more forthcoming about its data collection policies than Facebook, but it still clearly violated the Enterprise Certificate Program, which only allows these certificates to be used for internal apps for employees. Facebook was doing the same thing as Google with its “Facebook Research” app, and has also since lost access to its Enterprise Certificate, disabling all of the internal Facebook iOS apps and reportedly causing chaos within the company. Both Google and Facebook have disabled the apps that took advantage of Apple’s Enterprise Certificate program, but that did not stop Apple from revoking their Enterprise Certificates entirely. Facebook yesterday said that it was working with Apple to reinstate the certificate, and Google is also likely in discussions with the Cupertino company to solve the issue. Given the size of Google and Facebook and the importance of the Google and Facebook apps, Apple is likely to restore the certificates, but reinstated use may come with much more oversight.